Can you remember a time where you were tormented by another person, so much, you dreaded being around them? Just imagine if it was our culture for men to have more than one wife, and the wife’s value was based upon her ability to have children, especially male children. This was the case for Hannah in I Samuel, Chapter 1. Elkanah had two wives, Hannah and Peninnah. Peninnah gave Elkanah sons and daughters, but Hannah wasn’t able to have children because God had closed her womb. Peninnah gloated over the fact she had given Elkanah children, and Hannah could not. She tormented Hannah so much, when they went on their yearly retreats for Elkanah to worship and sacrifice to the Lord (I Samuel 1:3), she wouldn’t eat. She only cried. The Bible says in I Samuel 1:5, Elkanah loved Hannah very much. When he gave a portion of the offerings to his family, he gave Hannah a double portion. There was nothing Elkanah could do to ease Hannah’s pain. Verse 10 says Hannah was in “bitterness of soul and prayed to the Lord and wept in anguish.” This bitterness of soul was the same as grief or mourning. I have been through such things in my life personally. I too grieved in such a way. No one could ease my suffering except the Lord. When I wasn’t praying and crying in anguish, I was talking to someone about the emotions stirring inside of me. In my distress, I complained and shared my “bitterness of soul” with those I could trust. When I read Hannah’s story, a few things stood out, which I had not noticed before. Verse 11 says after praying and crying to the Lord, she made a vow to the Lord. If He would look upon her affliction, remember her, and give her a son, she promised to give her son to the Lord all the days of his life with no razor to ever touch his head. In verse 13, Eli, the priest, saw Hannah’s lips moving but no sound came out. He thought she was drunk, but she was praying in her heart. Do you see what I see? Hannah “poured out her soul”, her bitterness, to the Lord. For years she had been tormented by Peninnah. She kept her complaints to herself until finally, she had to “pour it out” to the Lord. After sharing this with Eli, Eli told her to go in peace and God would grant her what she had asked for. As she went, verse 18 says her face was no longer sad. If you know the rest of the story, Hannah, conceived and gave birth to Samuel, who served the Lord as Hannah vowed he would. God gave Hannah exactly what she had asked for and more. She later had three more sons and two daughters. Do you see it? Hannah was tormented by an adversary in an area which caused her much grief. She carried this “bitterness of soul” around with her and kept it to herself. Before Abba could fill Hannah with His promise, she had to first pour our her stuff, her bitterness. Once she had done so, Abba could fill her with His provision, His hope for her, His desire for her, His heart for her. What stuff in your heart is blocking Abba from filling you up with His desires for you? 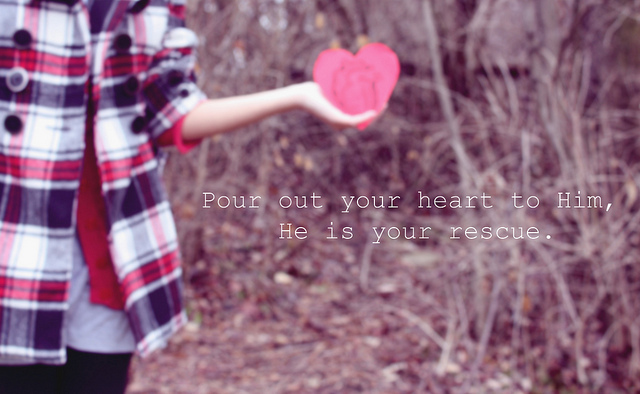 What do you need to pour out, so He can pour in? Just like Hannah, Abba can restore what’s been taken or stolen. If you will pour it out to Him, and believe, and worship Abba, the giver of all things. About a month ago, my husband and I had to make a hard decision about our twelve year old dog Bruce. It had only been since last summer that we found out he had nerve damage in one of his hind legs and foot. He could still get around and play with our other boxer, but a few months ago, we noticed he was struggling to get up. For a while, we were able to lift him from behind. He would walk to where he wanted to go, and then lie down. Some weeks later, when we would pick him up, he could only go a few steps and would fall. It eventually got to the point where he couldn’t get up at all. The nerve damage had spread to his other hind leg and foot. My heart broke as we tried to care for him. A week went by with us changing padding under him where he would use the bathroom. If we weren’t in the family room with him, he would howl nonstop until we came back. He quit eating unless it was table scraps, and he could only drink water if we held his bowl for him. The decision was finally made to call the vet and have him come out. We all said goodbye to Bruce as he died peacefully with my boys cradling his head in their arms. We all grieved. My oldest cried it out for a few days. Our younger son went out to where we buried Bruce every day for a week. He would walk back and forth and talk to Bruce and come in crying. My husband cried, especially when the boys were upset. I tried to hold it in. It wasn’t possible the first couple of days, but as the days passed, I could hide the sorrow. In doing so, I felt overwhelmed with just daily things. I was quick to get mad. I even went to my accountability group and glossed over how I felt. I didn’t really want to talk about it. When one of the girls asked me what was going on, I talked about feeling overwhelmed then got mad at her when she didn’t seem to understand. How could she? I have to admit, I would rather feel anything than the hurt going on inside of me. Mad worked. God, on the other hand, didn’t agree. I could hear “above all else, guard your heart, for it is the wellspring of life” (Psalm 4:23). Guard it from the bitterness that was growing. Guard it from the unhappiness that was settling in, the depression, the desire to shut down. My husband even accused me of ruining our relationship! God was calling. I heard Him, but I didn’t want to deal with this sorrow because it hurt too much. As weeks went on, I finally admitted to my husband I was still upset about Bruce. It may seem like such a small step, but for me it was the first step in dealing with what was really going on. One night, I sat on my closet floor after everyone was asleep, and just cried. And finally, I asked God to heal my broken heart. After weeks of feeling so much sadness, I finally felt joy again. 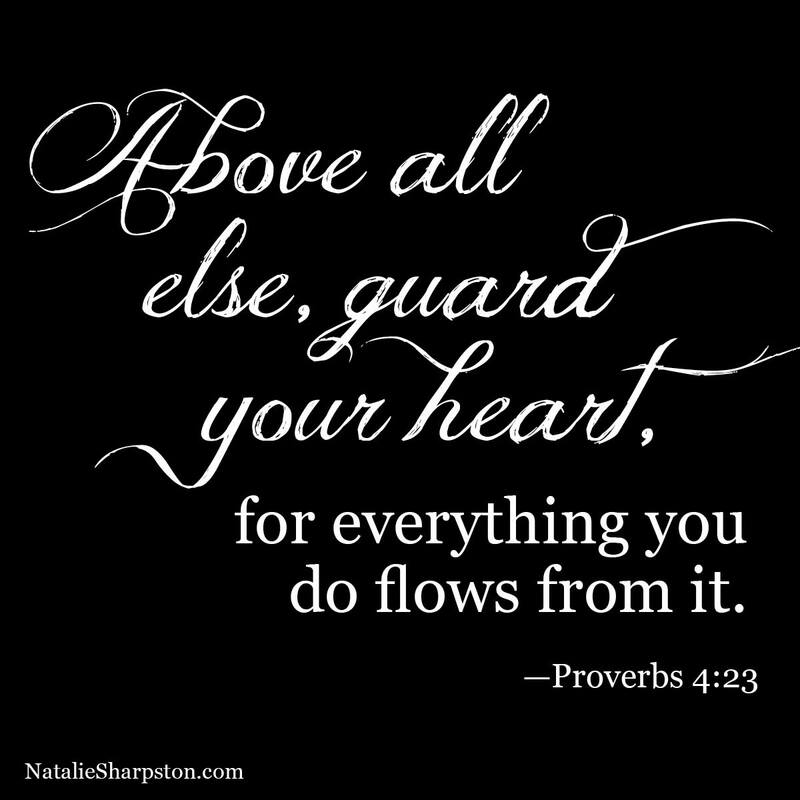 “Above all else, guard your heart, for it is the wellspring of life.” Are you guarding your heart? Is it filled with sorrow, envy, jealousy, bitterness? If so, are you hanging on to these things? Whatever is in your heart, will overflow into your thoughts, your words, your actions. The condition of your heart affects every relationship you have. God wants you to have a healthy heart, filled with Him, so it overflows to others. Would you ask Him to cleanse it, to heal it, to fill it with His love, to make it healthy once again?